When it comes to the best studio monitors for mixing, the solution isn’t exactly cut and dry. In the case of monitors, “best” is a very loose term that’s thrown about a little too much. Purchase a quality set of monitors, then make them work in the room you’re in. Also make sure that you target monitors that are flat, cold, analytical, etc. This will ensure that they translate well to everything else. It took a long time for me to finally bite the bullet and purchase a pair of studio monitors. What are studio monitors? My goal? To find the best ones for mixing and still have some money left over in my bank account. Lol. I did endless amounts of research (and still do! ), and kept going back and forth between websites to make sure that the reviews were sound and legit. I think people have this idea that research takes a long time, and that the more time you spend on it, the better your recommendations will be. To an extent that is true, but in my opinion a consensus about a product can be found relatively quickly. In the case of my own situation, I wanted to be doubly and triply sure that I was getting the right product. I’m sure you’re the same way. Budget. Of course this tops the list. What is your price range? In many of my articles, I like to hover around the affordable, entry level range, and then branch out a little. 1) It helps people to realize that I’m not trying to trick them into buying something outlandish 2) It’s where I reside when I’m looking for a quality piece of gear. Sometimes the most expensive is not necessarily the best. This is apparent with a lot of home studio equipment. It’s more about technique and ability. Room treatment and size. How big is the room you will be mixing in? Small/Medium sized bedroom? Professional studio? Large living room type area? This may be the most important consideration. If you’re in smallish bedroom, you’re not going to want large speakers. First off they will be too loud, and second they will sound terrible without Acoustic Room Treatment. The good news is that you can get away with 5″ speakers in a smaller room with little to no room treatment. For instance, my LSR 305’s sound fine in my medium sized bedroom with no acoustic panels or bass traps. However, they will sound even better with panels, and it’s something that I plan to invest in soon. You should as well, especially if you plan to upgrade to 8″ monitors in the future. Your audio interface. This is an important one because it enables you to hear the sound! You could opt for a mixer as well, it just depends on if you’re more hands on with mixing or if you like to use software. I personally prefer software. Check out my article on bit depth vs. sample rate to learn more about how your computer processes the sound from said interface! You can also check out my Focusrite Scarlett 2i2 Review for a good entry level unit. Bass ports. I’ll be honest, the 305’s are rear ported and need some wall treatment more so than a front ported unit. You should definitely take this into consideration because it’s easier to mix in a small untreated room with front ported speakers. Placement. With Nearfield monitors, they sound best right in front of you, forming an equilateral triangle with your dome. These are best in a small home studio environment. Also make sure that the tweeters are at approximately ear level. This way you can hear everything going on that much better. Nearfields are tricky. If you’re out of range ever so slightly, the music will sound different. 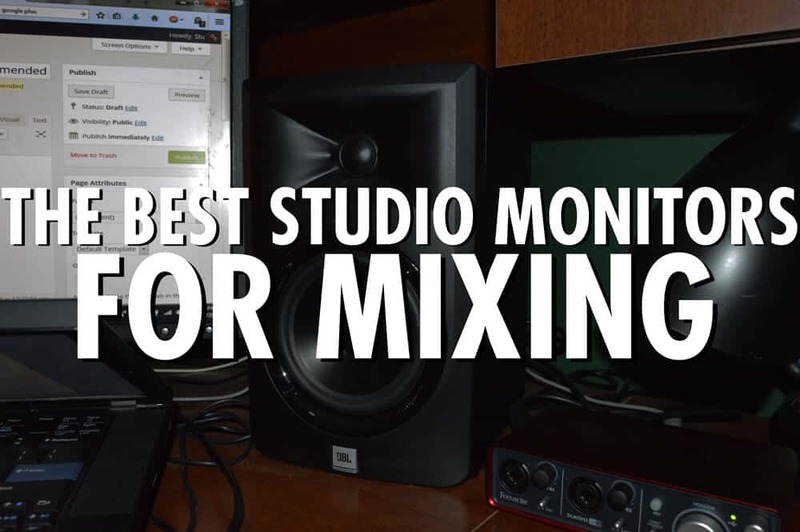 Farfield monitors are those typically found in commercial studios. They are larger and can handle louder volumes better than Nearfield monitors. Check out this great article from Joe Gilder on Studio monitors! That said, all of these are great options for mixing, and have come up the most times in my search. Keep in mind I’ve been digging around on an off for awhile now, so I have a pretty good idea of what the deali0 is. Lol. Yamaha HS5. A bit more flat than the 305’s, and some say more accurate overall. They are definitely bass light however. Check out my JBL LSR 305 vs. Yamaha HS5 comparison! JBL LSR 305. I have the 305’s, and I highly recommend them, but knowing that the HS5’s are flatter, I would rank the 305’s as runner up. They have a neutral, accurate sound, and really pack quite a punch for an entry level set. Some say the bass on them doesn’t hit that hard, but I would disagree. It definitely isn’t overly boomy or punchy, but it’s tight and has authority. JBL LSR 305 Review. Presonus Eris E5/E8. Similar to the 305’s, but less neutral. The E8 is ideal for more bass heavy music, as it’s frequency range goes down to 35 Hz. Yamaha HS8/HS7. The HS8’s bass is deeper and hits harder than the HS5’s. For another article with in depth info on the HS8: Yamaha HS8 vs. HS7. The HS7 is pretty similar as well, with a 6.5″ woofer rather than 8 or 5. Equator Audio D5. Very flat and neutral, with great stereo separation, depth, precision and clarity. Also has good bass but don’t expect to be blown away by it. Audioengine A5. A Very honest set of speakers, and very revealing. You will be able to tell a good recording from a bad one. As mentioned in the open, deciding on a good pair of studio monitors is less about brand and more about your room, as well as how accurate the monitors are. A lot of the entry to mid level options are very similar and of great quality. If you’re in a small to medium sized room, 5″ monitors are the way to go. You can get some foam panels and bass traps and you’re set. If you plan on recording in a larger room, 8″ monitors are ideal because the sound has more room to breathe. Acoustic Sound Treatment is of greater importance here however because of the bass being heavier. If you don’t have some bass traps and panels, your mix will sound extremely muddy and sloppy. You will be in for a world of pain like Smokey from Big Lebowski. Lol. My recommendation for today over everything is the Yamaha HS5 for smaller rooms, and the HS8 for larger rooms, with the 305’s coming in as the honorable mention and top budget pick. SEE THE HS8/5’s FOR YOURSELF ON AMAZON!! Well that’s about it for today my friend! I hope you’ve come away with some valuable information on the best studio monitors for mixing!! Which of these bad boys suits your fancy? Let me know as well! Until then.. Thanks for stopping by Franni! website. But after reading this article, I think I’m going to add the Yamaha HS5 to my list coz it’s a good option for smaller rooms. Gotta do a looot of further research so I can choose the best monitors. Thanks for stopping by Stan!